Thank you for your interest in St. Francis by the Lake. We're an Episcopal Church, part of the Diocese of West Texas. We invite you to come and worship God with us and get to know us better. Our mission is to live, learn, and share the love of Christ, the Word of God, and the power of the Holy Spirit with... everyone! 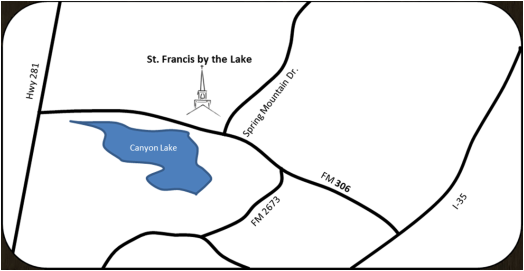 We strive for a welcoming spirit of hospitality and hope that you will consider making St. Francis by the Lake your church home. Take some time to browse through our website for information about our parish family and about The Episcopal Church. We'd like to extend our invitation to you: "Come as you are; leave better." Adult Ed - Sundays @ 9:15 a.m.
Children's Sunday School - Sundays @ 10:30 a.m.
Come as you are... leave better.